​Born out of the famed New Zealand School of Music in 2011, the then three piece band has spent the last five years expanding their repertoire (and members) into a full seven piece ensemble. Featuring a solid backbone of drums, bass, vocals and guitars, and complemented by some of Wellington's finest horn players, Tunes of I - or TOI as they are also known - is renowned around the country for their original, tight and refreshingly dynamic live performances. Having recently celebrated five years as a band, TOI have been working hard to cement their place in the New Zealand music scene. Most notably, the past two years has seen the award-winning band advance in leaps and bounds from their humble beginnings. During 2014 they were recipients of funding from theaudience.co.nz, resulting in their music video Give In, which enjoyed more than six weeks on rotation on Edge TV. They then pursued more than 25 shows around the country in summer 2014-15, rivalled only by a tour of slightly more magnitude the following summer, which celebrated the release of their debut album Restless at the end of 2015. Restless - the result of a Kickstarter campaign which raised more than $13 000 - was recorded in Surgery Studios by Lee Prebble, mastered by Mike Gibson of Munki Studios, and produced by Barnaby Weir of the Black Seeds and Fly My Pretties. Its release at the end of November 2015 was celebrated with performances at Rhythm & Vines and Soundsplash, as well as more than 25 shows around the country as support and headlining acts alike. 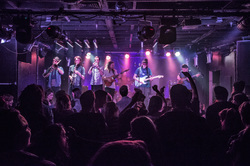 Tunes of I opened for The Original Wailers on Bob Marley's 70th Birthday in early 2015, and have twice opened the Wellington leg of two Sticky Fingers tours, to sold out audiences. They also performed alongside headliners The Black Seeds at Hokitika Wildfoods Festival, and have toured with Australian band Paua and New Zealand bands Brendon Thomas & The Vibes and Summer Thieves. The band is known for their on-stage dynamic, where their touring experience and Jazz School credentials force you to take notice. Not only is their musicianship and skill remarkable, but the solid musical and personal friendships between the members is obvious from the first note. Music isn't a product for Tunes of I, it's an experience; let them take you on a musical journey through a varied set performing their special blend of dub, roots, soul and psychedelic flavours, and watch as they unexpectedly swell into a single, resonating entity where all seven members blend into one collective presence.